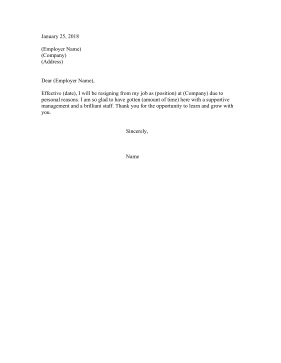 Professional and brief, this resignation letter indicates only personal reasons for their resignation. Effective (date), I will be resigning from my job as (position) at (Company) due to personal reasons. I am so glad to have gotten (amount of time) here with a supportive management and a brilliant staff. Thank you for the opportunity to learn and grow with you.